To receive personal support services you must be a Momiji tenant and be 65 or more years of age. Momiji provides personal support from 7:00am to 10:00pm, but is unable to provide 24-hour onsite services. Cancellation Procedures: There is no penalty for appointment cancellations made a minimum of 48 hours in advance of the scheduled appointment. There is a $25 fee for cancellations made within 48 hours of the scheduled appointment. However if the cancellation was due to an emergency the cancellation fee is waived. Gratuities: At any time, Momiji staff are not permitted to accept gratuities or gifts of any type for any service rendered. 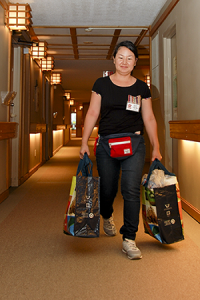 To ensure Momiji tenants safety, daily checks are provided between 7:00am and 10:00pm either by telephone or in person. Tenants can request a time of day for the checks to accommodate their needs. Tenants are responsible for advising Support Services if they will not be available during their scheduled daily check time (e.g. out for a doctor’s appointment, social engagement, etc.). During a daily check, PSWs cannot provide any other service (i.e. incontinent care, meal and fluid reminders, etc.) that is not related to daily checks. If a tenant does not answer the telephone or respond to a knock on the tenant’s apartment door, it will be assumed that something has happened and two PSWs will enter the apartment to investigate. If the tenant is found in an emergency, 911 will be called. Every Wednesday morning Momiji provides scheduled trips to the local grocery store (Metro, 3221 Eglinton Avenue East). The first bus leaves at 9:15am. Momiji tenants must sign up by adding their name to the Grocery Shopping binder located in the Tenants Lounge on the main floor. Additionally, a Momiji tenant can submit to the Support Services office their grocery list and money and a Momiji PSW will do the shopping. The deadline to submit grocery shopping requests is Tuesday at 4:30pm. On occasion if the tenant is ill, a Momiji PSW will pick-up the grocery list and money directly from the tenant’s apartment and the purchased groceries will be delivered to the tenant’s apartment. Grocery items cannot be returned and refunds will not be made. Bathing service can be provided up to twice weekly in the Momiji tenant’s room or in one of Momiji’s walk-in baths located on the 3rd or 4th floors. Tenants are responsible for providing their own soap, shampoo, towels and any other bathing products they wish to use. If a third bath is desired, other than in an emergency, a fee will be charged. Morning and evening care includes helping the tenants with brushing their teeth or cleaning their dentures, washing their face, combing their hair, toilet care and assistance with dressing and/or changing into pajamas. Special Events: Momiji offers a variety of seasonal and cultural special events throughout the year and gathers our community to enjoy a festive meal and a program of entertainment or activities. These include our Christmas Dinner, Summer Barbecue, Seniors’ Day, the traditional Japanese Girls’ Day and Boys’ Day festivals, and many more. 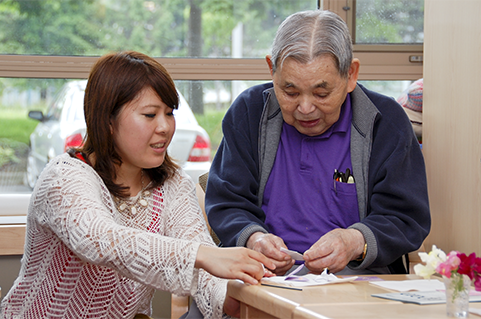 Momiji also organizes excursions for seniors to join community activities and dine out. Western Lunch: On Wednesdays, when our Japanese restaurant is closed, Momiji offers a Canadian-style “Western” lunch. This lunch is catered by Epicure Catering, a company specializing in providing nutritious, affordable hot meals for seniors. Momiji’s PSWs can only remind Momiji tenants to take their pre-measured medications and cannot administer the medications directly. It is the responsibility of the tenant or tenant caregiver to fill their weekly dosette box or arrange for a pill pack service through a pharmacy. During a medication reminder visit, PSWs cannot provide any other service (i.e. incontinent care, meal and fluid reminders, etc.) that is not related to medications.